President Trump surprised purveyors of speculation over the weekend by selecting a White House budget office associate to be the permanent director of the ever-controversial Consumer Financial Protection Bureau. 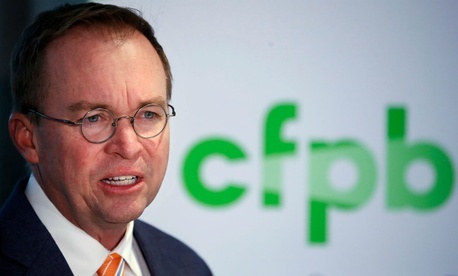 Budget director Mulvaney, whose tenure doubling as head of the bureau is set to end on June 22, re-abbreviated the agency’s name as BCFP for Bureau of Consumer Financial Protection. He may now stay at the bureau for another 210 days under the Federal Vacancies Reform Act now that the president is submitting a long-term nominee. Reaction to Kraninger’s name was mixed in the consumer activist and banking communities. The Marquette University graduate with a law degree from Georgetown University Law Center monitored five mostly homeland security-related agencies as associate director at OMB. Criticism was also heard from conservatives. As The New York Times reported, J.W. Verret, a law professor at George Mason University and a former top aide to the House Financial Services Committee, compared her nomination to the 2005 debacle for Harriet Miers, who was unsuccessfully nominated to the Supreme Court by President George W. Bush. “This job is too important for word-of-mouth recommendation alone,” he said. An administration official told the Times that Kraninger’s “low-key” style would draw attention away from Mulvaney’s aggressive approach to regulatory policy changes.